Whether disabled or not, restraining children securely in a vehicle is important to protect their safety and prevent injury in the event of a car accident. Unfortunately children with disabilities present challenges often which standard off the shelf child car seats can't accommodate. Each, as described below, offer solutions for parents of disabled kids to allow them to transport their kids safely and securely. Pediatric car seats for kids with disabilities are not a lot different than regular car seats other than they are bigger to allow customizing of the padding. They are also available in sizes which will accommodate larger kids who normally would be using a booster seat or nothing at all due to their size. 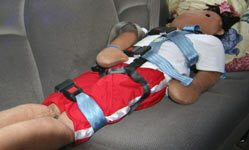 All models utilise a strapping system to secure the seat to the vehicle and the child to the seat. Almost all models allow for customising of the padding for a proper fit and have some method of growth to accommodate the child as they grow bigger. Some models have removable sides on the seat section to allow the child's legs to splay apart if needed. Another style of bath seat as pictured to the right (Manatee Pediatric Bath Seat) provides a depth adjustable seat that the child can recline on with waist strapping for holding them in place. This particular product is height adjustable in addition to an adjustable recline and leg angle. Other included options can include padding for lateral supports and head support. Bath supports and seats will often come in two or three different sizes to accommodate kids of different ages and stature but are limited by the size of the bath tub they will be used in. A car bed is designed for infants and young children with severe physical disabilities. It is a side-facing transportation device which enables the child to lie flat while being transported instead of the sitting position required with a car seat. The child rides in the fully padded and covered plastic shell facing sideways on the car seat. The child may be secured in the car bed with strapping or placed into a sleeping or bunting type bag attached to the car bed. An automobile style seat belt securely attaches the bed against the seat back. There is a product on the market known as a E-Z-On Vest which is a harness made up of a series of straps that the child fits into and is secured to the rear seat of the car with the existing vehicle seat belts. When used, the child can be restrained in a seated position or laying down on the seat depending on the model of E-Z-On Vest purchased. For more information on the E-Z-On Vest please visit the manufacturer's web site at http://www.ezonpro.com/index.shtml. The products on this page must be purchased in Canada, from a Canadian vendor to be legal for use in Canada. Please read this .pdf file from Transport Canada for more information: Cross Border Shopping for Car Seats.